Inspired by a deep-seated conviction that luxury isn’t always synonymous with gold and marble, the iconic Soneva brand instead proves that opulence can be au naturel. The dynamic husband-and-wife duo behind Soneva, Sonu and Eva Shivdasani, believe that to live with sand underfoot, to bathe outdoors beneath a canopy of lush vegetation, and to dine under starry skies is what true luxury is all about. During the construction of their flagship resort, Soneva Fushi, they refused to use any rainforest or unsustainable wood, and instead constructed the world’s first castaway chic resort from environmentally-friendly materials like bamboo, coconut and recycled wood instead. In doing so, they birthed the back-to-nature, barefoot luxury trend that has gained popularity globally over the last two decades. In addition to their annual sustainability reports, this innovative tool allows the company to review the direct effect their resorts are having on the environment, as well as the indirect impact of their supply chain and air travel for guests; in turn positioning them to make better decisions, efficiently allocate resources and influence the business decisions of suppliers. From the smiling team of Mr. and Ms. Friday butlers, to the resorts’ sommeliers, gardeners and chefs, the committed and passionate hosts that make up Soneva are the real heroes of the company’s sustainability initiatives. These hard-working individuals are known affectionally as the Soneva Changemakers. Speak to any of the Soneva Changemakers and they’ll tell you that they live and breathe by the brand’s SLOW LIFE acronym, which encapsulates the ideologies of Sustainable, Local, Organic, Wellness, Learning, Inspiring, Fun, Experiences. Guests can choose from a mind-blowing list of once-in-a-lifetime experiences that are designed to immerse them in the extravagance of nature, including a sunset dolphin cruise, snorkelling with mantas, stargazing at Soneva Jani’s overwater Observatory, embarking on a guided aquatic adventure, or catching an exclusive wave with the world’s first eco-surfing program. ‘Soneva Surf’ is an eco-friendly surfing experience that aims to be a model for sustainable surfing around the world where surfing gusts can select the experience that suits them, according to their level of expertise, time and budget. Everything required for a day in the ocean, from rash guards to sunscreen and wax, is provided and is (of course) entirely eco-friendly. Soneva’s eco boards are made from poxy resin, bamboo woven mats, and bio-foam, which comprises materials converted from natural plant materials (soy, sugar, algae). Manufactured by an approved ECOBOARD builder, the production of these boards produces 40% less carbon dioxide emissions than regular surfboards. All glass is crushed and re-blown onsite (in a professional, dedicated glass-blowing studio at Soneva Fushi) into decorations for the resorts or household items that are donated to charity. Both resorts create their own cooking charcoal and coconut oil, grow their own produce (fed by compost from resort waste and nutrient-rich water from water treatment ponds) in extensive organic vegetable gardens, house solar panels to save fossil fuels, and are absolute visionaries when it comes to plastic. In 2008, they banned imported water, saving approximately 1.5 million plastic bottles since then. As part of their ‘Soneva Maker Programme’ and in partnership with global grass-roots initiative, ‘Precious Plastic’, Soneva recycles plastic that washes onto the resorts’ pristine shores, making a range of useful products like flower pots and building blocks. Guests and resort hosts are invited to get creative with plastic waste and some of the innovative creations they’ve come up with include surfboards made from recycled polystyrene and Easter eggs for children made from plastic bottle caps. 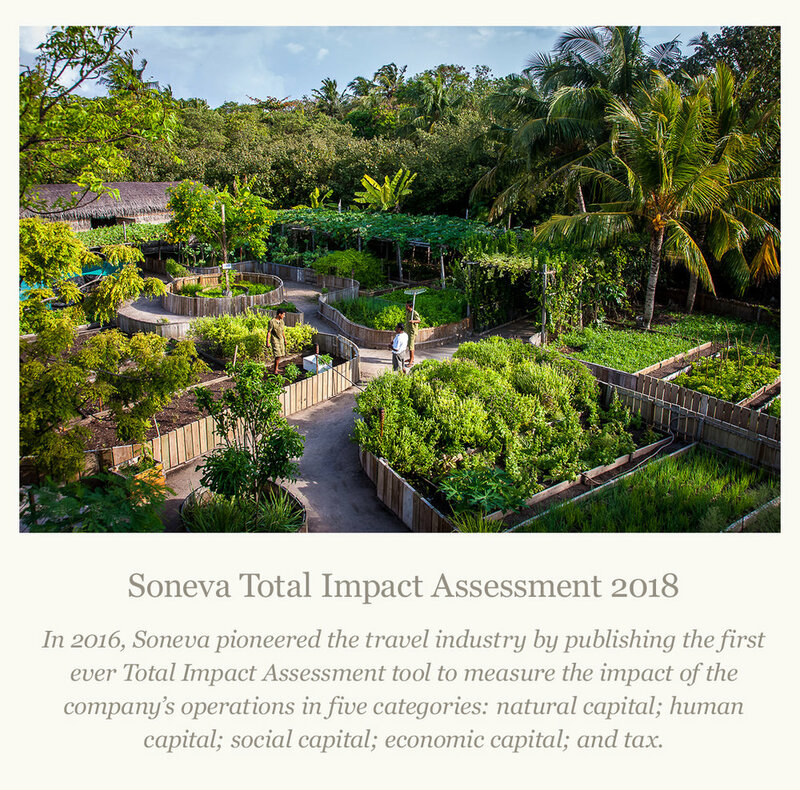 Both properties also apply a small carbon levy to all guests to offset both direct and indirect carbon emissions across all Soneva operations. The funds collected from this levy go into various projects – from building wind turbines in India, planting trees in Northern Thailand, funding fuel-efficient cooking stoves in Myanmar, and supplying safe drinking water to thousands around the world. Through the Soneva Foundation, the company has funded hundreds of environmentally-focused projects. Whether they’re overseeing the Soneva forest reforestation project; conducting biodiversity research with a team of in-house biologists; holding a SLOW LIFE symposia to promote environmental and social collaboration in local communities, or organising a larger annual symposium, which brings together the greatest academic, political and business minds for a partnership on the most pressing issues in the world, the team at Soneva are forever conscious of their footstep. The Soneva quest isn’t about resting on the company’s laurels; it’s about striving for the only breed of hospitality befitting of our precious planet – perfection. Addicted to Maldives have some very exclusive offers for Soneva Fushi and Soneva Jani. Contact our team to make your way to your favourite Soneva Maldives Luxury Resort.